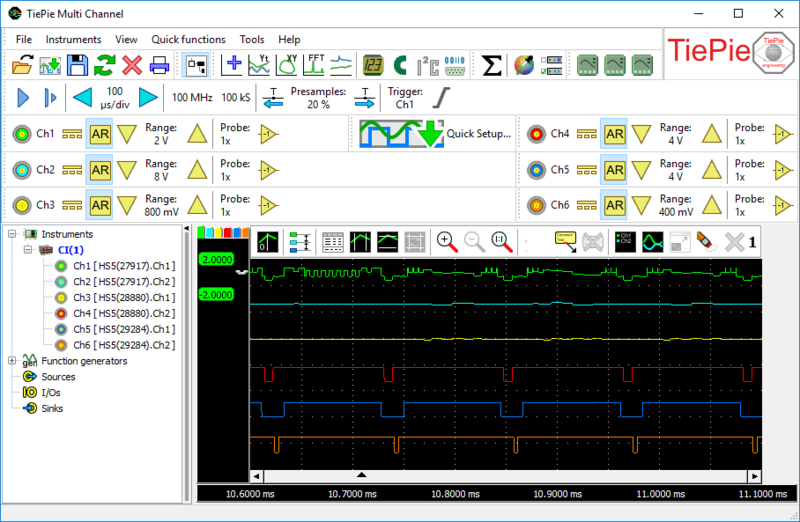 When two or four measurement channels are not sufficient, the Handyscope series of instruments offers a possibility to combine and synchronize multiple oscilloscopes to one single oscilloscope with many input channels. Just a coupling cable is required to combine the multiple instruments via their CMI interface to a single combined instrument with many channels. The maximum number of instruments is only limited by the number available USB ports. 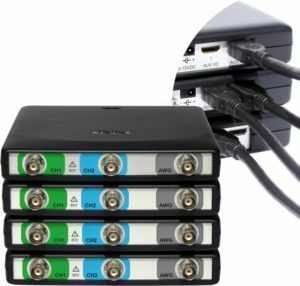 The unique CMI (Combine Multiple Instruments) interface provides an easy way to couple multiple oscilloscopes to one combined and fully synchronized oscilloscope. The high speed sampling bus takes care that each Handyscope is fully synchronized to ensure that even at the highest sampling rate the instruments operate at the same sample clock (0 ppm clock error!). The high speed sampling bus is automatically configured and terminated at the beginning and end of the bus. Apart from a synchronization bus, the CMI also contains a trigger bus. This allows to trigger on any channel of the combined instruent, as well as any of the internal generator trigger sources, when instrument with a generator are combined. The high speed trigger bus is also automatically terminated with the correct impedance at the beginning and end of the bus. The CMI interface supports automatic recognition of the instruments. It has built-in intelligence to detect the connections, so instruments can be connected to each other in random order. The connection order when combining multiple instruments is not important. Placing terminators and determining the proper connection order is not required! automatic master/slave setting of the sampling clock bus. Combining the instruments is fully automatic. When the Multi Channel oscilloscope software is started, the coupled instruments are recognized and combined to a large instrument. Combining e.g. four Handyscope HS5s results in a unique 8 channel 12 bit 500 MS/s oscilloscope. All channels of the four units sample fully synchronized and can be controlled in one application. The user gets one oscilloscope. Coupling of e.g. five Handyscope HS6 DIFFs gives an ultimate and unique 20 channel 12 bit 1 GS/s oscilloscope! The video shows how to combine and synchronize multiple oscilloscopes using the unique TiePie engineering Combine Multiple Instruments interface, where all channels are sampled using the same clock, with 0 ppm clock error, and shown together in one graph.